This entry was posted in vrd on November 29, 2013 by /u/turnersr. This entry was posted in vrd on November 29, 2013 by /u/HockeyInJune. XPath is a language that has been designed and developed to operate on data that is described with XML. The XPath injection allows an attacker to inject XPath elements in a query that uses this language. Some of the possible goals are to bypass authentication or access information in an unauthorized manner. Browse to the login.php page; here we can see simple login form. As in a common SQL Injection attack, we have created a query that is always evaluated as true, which means that the application will authenticate the user even if a username or a password have not been provided. If there is no knowledge about the XML data internal details and if the application does not provide useful error messages that help us reconstruct its internal logic, it is possible to perform a Blind XPath Injection attack whose goal is to reconstruct the whole data structure. Browse to the search.php page. Enter any number, When you provide number it will display FirstName related to their ID. Enter ' or '1' = '1 in search , & you will get all FirstName regardless of any ID(Number). In blind Xpath injection we have to provide special crafted query to application, if query is true we will get result otherwise we will not get any result.Till now We don`t know about any parent or child node of XML document. Supply following query to application & observe result. You get result , It means first letter of parent node is "E"
Following the same procedure, we can extract the full name of the parent node, which was found to be 'Employee'. We can also get child node. Browse to the xpath.php page & enter following query. You got output from parent node Employee id 3 & child node whose position is 2. To get whole document put following query. count() returns the number of child nodes of a given element, which can be used to determine the range of position() values to iterate over. string-length() returns the length of a supplied string, which can be used to determine the range of substring() values to iterate over. I used recon-ng xpath bruteforcer for xpath injection attack & we will get back end XML file. This entry was posted in authentication bypass, XPath Injection on November 29, 2013 by Unknown. Episode #172: Who said bigger is better? "I have a number of batch scripts which turn a given input file into a configurable amount of versions, all of which will contain identical data content, but none of which, ideally, contain the same byte content. My problem is, how do I, using *only* XP+ cmd (no other scripting - PowerShell, jsh, wsh, &c), replace the original (optionally backed up) with the smallest of the myriad versions produced by the previous batch runs?" This is pretty straight forward, but it depends on what we want to do with the files. I assumed that the larger files should be deleted since they are redundant. This will leave us with only the smallest file in the directory. Let's start off by listing all the files in the current directory and sort them by size. Sorting the files, and only files, in the current directory by size is pretty easy. The "/A" option filters on the object's properties and directories are filtered out with "-D". Next, the "/O" option is used to sort and the "S" tells the command to sort putting the smallest files first. Finally, the "/b" is used to show the bare format. At this point we have the files in the proper order and in a nice light format. We can now use a For loop to delete everything while skipping the first file. There you go Ted, and in PowerShell even though you didn't want it. Here comes Hal brining something even smaller you don't want. It's actually not that different from Tim's PowerShell solution, except that my "ls" command has "-S" to sort by size as a built-in. We use the "-r" flag to reverse the sort, putting the smallest file first and skipping it with "tail -n +2". After I use "tail" to get rid of the first, smallest file, I use "tr" to convert the newlines to nulls. That allows me to use the "-0" flag to "xargs" to split the input on nulls, and preserves the spaces in the input file names. Then I just had to re-run the loop whenever I wanted to re-create my test files after deleting them. This entry was posted in Uncategorized on November 26, 2013 by Tim Medin @timmedin. This entry was posted in OSX on November 22, 2013 by Mila. This entry was posted in black hat seo, hidden links, Spam, Unmask Parasites on November 22, 2013 by Denis. Is MAM Identity and Access Management’s next big thing? Mobile Application Management is making waves. Recent news from Oracle, IBM, and Salesforce highlight the market interest. It's a natural extension of what you've been hearing at Identity trade shows over the past few years (and this year's Gartner IAM Summit was no exception). The third platform of computing is not a future state. It's here. And Identity and Access solutions are adapting to accommodate the new use case scenarios. ...onward and upward. This entry was posted in access governance, Identity, MAM, Mobile on November 21, 2013 by Matthew Flynn. This entry was posted in authentication bypass, mutillidae on November 20, 2013 by Unknown. As you know, veil is AV evasion framework for metasploit payload. On the 15th of every month, for the next year, at least one new payload module will be released.Yesterday they released two new payload. I used c/meter_rev_tcp. After setting of LHOST & LPORT ; when i try to generate it ; i got error. Okay now we successfully generated payload file, but we get compiler error while compiling into cross-platform exe. Error clearly suggest that i686-w64-mingw32-gcc is not installed.The mingw-w64 project is a complete run-time environment for gcc to support binaries native to Windows 64-bit and 32-bit operating systems.In short, to compile the payload for 64 bit windows ; we have to install mingw-w64. In case of 32 bit windows os , we can compile it,because when you setup veil environment mingw32 installed using wine. So our payload is compiled into exe for 32 bit windows. For this purpose you have to install mingw32-w64. Download from here & build it.If you don`t want to install it; then you can use pre-compiled version. I don`t test compiled exe in 64 bit, so if anyone use it, please let me know exe is working or not. If you want to build MinGW-w64 for Win32 and Win64 using automated bash script, click here. Our source file has been generated and got following error. Now our exe is generated,it`s in same source folder. This entry was posted in bypass AV, Veil error on November 16, 2013 by Unknown. 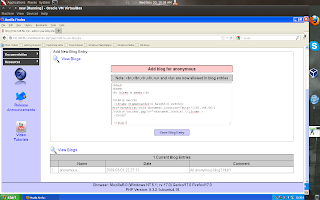 Username Enumeration in Mutillidae using Burpe Intruder. 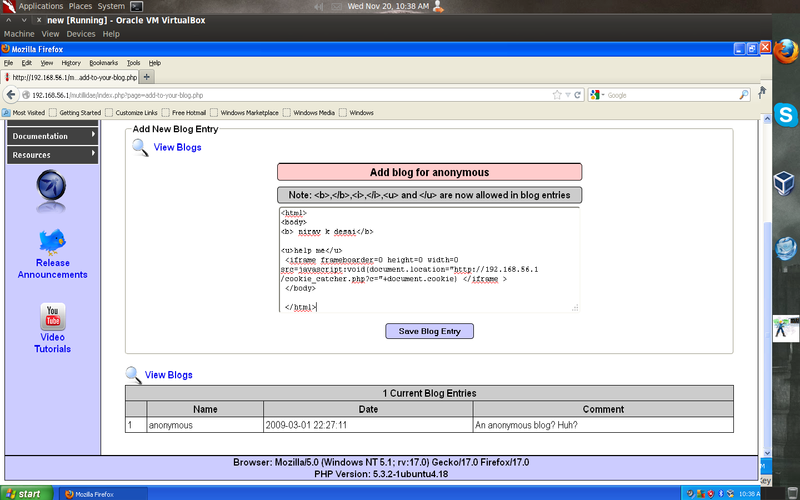 Mutillidae is a free, open source, vulnerable web-application providing a target for web-security tester. Mutillidae can be installed on Linux and Windows using LAMP, WAMP, and XAMMP. Username Enumeration :- We have an application that will reveal to us when a username exists on the system which can be used in further step like brute-force account. In Mutilliade login page , when you provide valid username & invalid password , web-application reply us that password incorrect. When we provide invalid username ; then application tell us that Account does not exist. So by monitoring web-application message one can know that username is valid or not. First we will examine source code of page ; when we provide valid username reply is "var lAuthenticationAttemptResultFlag = 1" & when we provide invalid username reply is "var lAuthenticationAttemptResultFlag = 0"
var lAuthenticationAttemptResultFlag = 1 It means username exist. var lAuthenticationAttemptResultFlag = 0 It means username does not exist. Alternatively we can do this by saving both page (valid username & invaild username) source code in text file & then use diff command. Now Open burpe suite, setup listener ; try to sign in from browser & capture request. Now right click on request & click on send to inrtuder. For position we choose only username. On payload tab ---) payload option ----) load sample username list. Now Burpe make request to login page & examine request & classified responce according to option which we provided. Click on save , result table & Delimiter click on custom & put ";" ,then select column which we need , in this case i select payload,var lAuthenticationAttemptResultFlag = 1,var lAuthenticationAttemptResultFlag = 0 and then save it. Saved file is look like following format. In file first is username ; then true means username exist , false menas username is invalid. So now we only need entry which second column is true. So i saved this value in another temp file from where you can extract username from file using delimiter. I used simple python script for this purpose. Finally we got list of username which exist on system. This entry was posted in Burpe, mutillidae, Username Enumeration on November 11, 2013 by Unknown.